Dynasty’s Black Gold® long handle brushes represent premium quality artist paint brushes which are designed to satisfy consumer demand for a higher level of performance. These brushes possess the features and capabilities discriminating fine artists demand and expect. Black Gold® is a multi-tapered brush with specific taper ratios. The filaments combined with the master brush makers’ create a brush series that is multi-purpose. We have developed an open stock program which makes superb quality brushes easy to stock in permanent displays. Our hand-crafted Black Gold® brushes are as distinctive looking as they are unique in their professional performance characteristics. 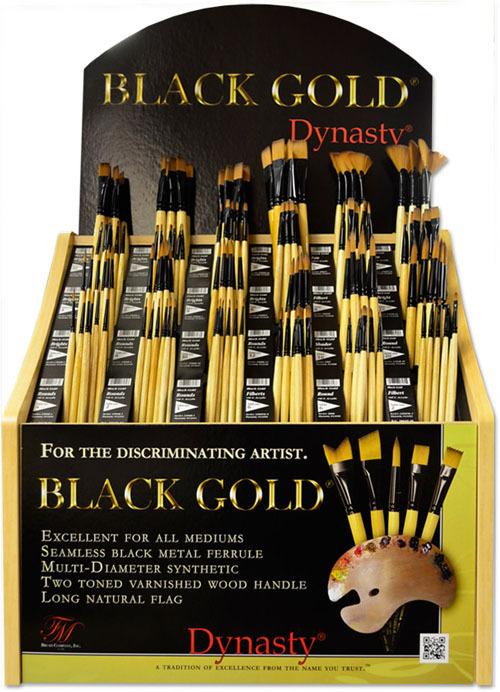 Dynasty’s Black Gold® short handle brushes with black chrome-plated brass ferrules represent a world-class brush line. Master brush makers use proprietary filament to provide a brush that is multi-purposed for oils, acrylics, and watercolors. We have developed an open stock program which makes superb quality brushes easy to stock on permanent displays. Our hand-crafted Black Gold® brushes are as distinctive as they are unique in their professional performance characteristics. These brushes possess the features and performance capabilities discriminating fine artists demand and expect. To insure authenticity, look for the Black Gold® imprint on the handle. Display Assortments are arranged in an elegant wooden cabinet. Each display assortment has coordinating graphics and labels for easy identification and reordering.